Promises To Keep is about Jilly Coppercorn and her life pre Widdershins. De Lint gives us flashbacks into her life as a teen runaway and how Angel helps her get off the street and introduces her to Geordie, Sophia, and the others. The book deals with some serious subjects: Abuse, drug abuse and death. Jilly had a pretty depressing life and the book is more gloomy than anything. It is a short book of 173 pages and a short read. In the story Jilly runs into Donna, an old friend from her days on the street. Donna leads her into an alternate world where 95% of the folks are dead, but happy living their lives, and coincidently are being given whatever they need to make them happy: House, food, money, jobs, etc. Jilly has worked hard to fix her life and the alternate reality is just too easy and doesn’t seem right for her so she tries to find a way back into the real world. 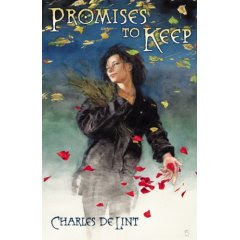 If you are a Charles De Lint Fan, than you will probably like the book. If you have never read any of his books, don’t start with this one. If you like secular science fiction, start by reading Onion Girl, Tapping the Dream Tree or his most current book about the town of Newford – Widdershins.